The National Ornamental Glass Manufacturers Association, now known as the Stained Glass Association of America, was organized in July 1903 at the Southern Hotel in Columbus, Ohio. In this meeting, 26 men represented 45 stained glass firms in person or by proxy. The major impetus of the meeting was money. The stained glass industry felt that European competition was unfair. In the decade before the formation of the National Ornamental Glass Manufacturer’s Association’s founding, another group — The United States Glass Workers — petitioned the U.S. Congress to create tariffs to equalize the European glass worker’s wage scale with that of America’s, a difference of almost three to one. Even more devastating than foreign competition was the domestic competition with debilitating price-cutting being the norm in the difficult depression-like era at the turn of the century. At the first convention, the Constitution and Bylaws were established. Joseph E. Flanagan of Chicago was elected President, George Mueller of Milwaukee, Treasurer, and Mr. Von Gerichten, Secretary. It soon became evident that the members would need some regular means of communication and Ludwig Von Gerichten began a periodical called The Monthly Visitor. Volume 1, #1 was published in 1906. It’s columns were open to all the members for expression of their individual views on any subject that could be of interest to the craft. The publication’s economic support came from the suppliers of glass, lead, and other materials of the craft, a practice that continues today. William G. Speier of Philadelphia took over editorship with the third issue of Volume #1 following his election as secretary of the Association at its second meeting in Boston in February, 1907. The official title became The Ornamental Glass Bulletin. In 1909, Joseph E. Flanagan, a former Association president, was elected secretary. He took over as editor with Volume 3, #2, a job he held until his death May 30, 1928. In July of 1909, the Association changed the publication’s name to The Bulletin of the Stained Glass Association of America. Flanagan became the first editor to introduce articles that touched on stained glass as an art form as well as reporting the numerous business concerns of the trade. A typical early magazine was approximately one-half advertisement and one-half copy. There would often be a picture of a rather mundane window furnished by a member. The magazine would often contain articles about member studios and short pieces about the glass industry. Following an Association meeting, complete minutes down to motion for adjournment were included. A great deal of column space was devoted to promoting tariffs on low price European imports, but with few results except during World War I, when France and Germany were completely shut off. However, the primary concern was the members who engaged in unreasonable competition. When the economy would tighten, prices would drop and in many cases windows were being made for less than cost. The magazine crusaded against the practice with a monthly litany of what composed overhead and costs that the art-and-craft oriented members never considered. Evidently, all was of little avail as horror stories of improper pricing were often included in the magazine. The next editor was Sydney L. Brown, 1928-1931. He continued the same format as the previous editor for Volume. 23, #6 to Volume 26, #9. One interesting addition was the serialization of John A. Knowle’s book, The History of the York School of Glass Painting. It ran sporadically from 1929 until 1950. When Brown retired in 1931, the Association tried a bold experiment with the appointment of Howard B. Burton, an architect, as Executive Director and Field Secretary of the Association as well as editor of the magazine, which was renamed Stained Glass. The format changed; the size increased and a notable addition in his first issue was a complete list of the members of the SGAA with street addresses. The experiment ended abruptly in September 1931 with Volume. 26, #9. The Association was teetering on the brink of economic oblivion in the midst of the depression. Association President Charles J. Connick, by far the leading luminary in American stained glass, led the rescue of the magazine. He appointed a team of part time editors, Harry Lorin Binsse, Maurice Lavanoux (secretary of the Liturgical Art Society) and his own chief associate, Orin E. Skinner. Starting with Volume. 26, #10 they carried on the format begun by Mr. Burton until Orin Skinner became sole editor with Volume. 28, #4. The magazine became a quarterly with the spring issue, 1933 and has remained one until today. Skinner promptly reduced the size to 5 x 8 inches and embellished the neutral gray covers with color plates left over from Connick’s great book, Adventures in Light and Color. The Association and the magazine surely would have disappeared during the depression had it not been for Connick and Skinner constantly pumping life into it. By 1948, the Second World War was over and Stephen Bridges, a fine stained glass artist with a wonderful command of the English language, took over from Volume 43, #3 through Volume 46, #2. In 1951-1958, the work of editorship shifted to still another quiet unassuming craftsman located in San Francisco. Norbert Graves maintained the general Skinner format with Volume 46, #3 to Volume 53, #3. A notable change, reminiscent of 1931, was instituted in 1958 when John G. Lloyd was hired as Editor and Executive Secretary of the Association. Although interested in art and photography, he had little knowledge of stained glass. He grew rapidly in the job and in 1963 wrote the fine book Stained Glass in America, the first book to really explore the industry in this country. He changed the format back to a larger size 7 _ X 10 _ and gradually began to use color after 1959. He also introduced the use of the SGAA seal on the back of the magazine. Lloyd’s tenure ended in 1970 with Volume. 65, #2 and William S. Clark, who was editor of Your Church Magazine, took over until he died in 1972 and was replaced by former editor Maurice Lavanoux. He published Volume. 67, #4 through Volume 69, #4. In 1975, the Association hired Dr. Norman Temme, a Lutheran Pastor with wide experience in public relations. His nine-year tenure witnessed some of the most dramatic changes in the publication. Working with Richard Brauer of the Valparaiso University Art Department, he doubled the content size of the magazine and introduced a number of new features, including four-color reproductions, which was made possible by Ken Urschel, General Secretary, who had originally recommended Dr. Temme for the job of editor. The magazine went from being a trade journal to a fine display magazine that was read internationally as the definitive publication about stained glass. Also, the magazine began to be indexed, increasing its use as an archived publication. Dr. Temme’s last issue, Volume 79, #2, was actually put together by transitional editor Kenneth vonRoenn, Jr., a talented young glass designer. Then came a dramatic year under the inspired artistic direction of noted glass painter and author Richard Millard with Volume 79, #3 – Volume 80, #4. Richard L. Hoover, a former glass craftsmen from Kansas City, replaced Millard in 1986 from Volume 81, #1 to Volume 90, #3. Under Mr. Hoover’s direction, Stained Glass as the official magazine of the Association, became one of the most important documents of the information about the art and craft of stained glass on a worldwide basis. He enhanced the high artistic standards instituted in the Temme regime and continued in the Millard regime. In the winter of 1995, Richard H. Gross, MTS, took over the editorship of The Stained Glass Quarterly. Under Mr. Gross’ direction, the magazine has continued to expand and now reaches an even wider audience. Richard Gross also introduced Internet publishing to the Association and developed the SGAA’s first website in 1996. While the magazine was the most important and enduring legacy of the early founders of the Association, the international catalogue stands as a monument to the folly of trying to establish standards in what still is essentially an artistic medium. The prices of the catalogues ranged from $2.00 per single copy to 16¢ each in lots of 20,000. Each studio was able to have its name printed on the cover and at the top of each page. 2 pages of beveled plate and clear D.S.A. In the October 1924 Bulletin is the last evidence of the catalogue in the form of an illustration of the covers of the Revised International Art Glass Catalogue (Domestic) and the Revised International Stained Glass Catalogue (Church). The domestic catalogue had 48 pages, and was “dressed up” in color. The price ranged from $5.00 per copy to 40 cents each in lots of 5,000. The church catalogue had 16 pages of colored designs and cost $5.00 per copy or 23 cents each in lots of 5,000 or more. Very few of the catalogues exist today and it is questionable how much influence they exerted on the stained glass industry. The designs were a boon to the small studio with limited artistic skills, but were mostly disregarded by the larger and more creative concerns. Today, the catalogue seems an anachronism as the government would doubtless clamp down on such obvious price fixing. In 1909, the tariff of 45% ad valorem stayed in effect. However, in 1913 under strong pressure of a clergy lobby before the Ways & Means Committee, the law was changed. In its new form, it read: “Glass windows, painted and stained, thirty percent ad valorem…Glass windows imported expressly for presentation for use in houses of worship including stained or painted glass …Free.” The word “Free” was to haunt any tariff negotiations for years to come. However, with the beginning of World War I in 1914, imports were cut back and what might have created an intolerable situation for an American studio was greatly relieved. The extremely poor economic climate in the depression, and later during World War II, served to limit European imports for the next 30 years. It also reduced the number of active stained glass companies in this country from nearly 900 in 1929 to a little over 200 in 1950. The great rebirth in building in 1950 saw a tremendous increase in foreign work. The SGAA began a campaign to have the tariff laws changed since the tariff had been reduced to 30% ad valorem in 1952 and the $15.00 a sq. ft. “duty free” regulation was totally inadequate in the terms of the value of the dollar in the 50s. The Association spent a great deal of money during this period with public relations firms, lobbyists, and lawyers to seek relief from this foreign invasion which grew to a 900% increase in the ten years between 1950 to 1960. With our labor-intensive industry and the European wage scale at least five times lower than America’s, the cause seemed hopeless. Whether or not this bill ever had any effect has not been recorded. The tremendous business expansion of the 1960s and the emergence of American artists and studios doing all types of stained, faceted, laminated and decorated glass, combined with a gradual parity of wage scales due to the interplay of international trade caused the tariff question to fade into oblivion. American studios began creating stained glass for Europe and Japan and the specter of low cost imports from the Far East, while still a threat, has in no way diminished the boom enjoyed by the industry in the last two decades. In retrospect, money spent to encourage tariffs was largely wasted; artistry and a robust economy were the tonic needed to foster American stained glass. There were however, several instances when the Association was able to get serious problems of the industry solved by petitioning the proper government offices. For example, during World War II, the craft was almost brought to a standstill by the prohibition of the use of lead. Karl Lamb and Henry Lee Willet were able to get relief from the Department of Interior by pointing out they were still making stained glass windows in Great Britain with lead shipped there from the United States. Lead was soon available to American stained glass makers. In the 1970s, Patrick White worked to exempt stained glass from tightening Federal standards for entrance glazing requirements. In the early 1990s, the Association again rallied to combat heavily restrictive regulations on the use of lead, which resulted in an exemption for art glass. In 1942, Harold Rambusch raised the question of proper training for stained glass artists and craftsmen. Since the craft had developed so far in the preceding 20 years, it was beginning to suffer from a lack of well-trained people, particularly glass painters. A questionnaire was developed and sent to all the studios in the Association. The overwhelming response was for a nationally accredited program, which was instituted in 1945. By 1947, the program has been in place a year with 45 apprentices in training nationwide, a majority being veterans. The Joint Apprenticeship Committee consisting of representatives of the SGAA, the Brotherhood of Painters, and the U.S. Government Apprentice Training Service worked out a four-year program. It consisted of two categories, one for the artists or glass painters and the other for craftsmen. The first year, each would spend a number of hours in the other category’s discipline then, the last three years, concentrate in their own particular field of interest. This served to produce truly well rounded stained glass artists and craftsmen. In 1959, the standards were revised to reflect new techniques such as faceted glass; it was pointed out that the program applied to both union and non-union shops. Apprenticeship flourished during the 1950s and 1960s. In the mid-1970s, six-hour courses sprang up that promised to teach what used to take four years to learn. This, coupled with the lack of union influence in the stained glass movement, caused apprenticeship gradually to disappear, except in the largest and best-established studios. A last ditch attempt was made to modernize and shorten the apprenticeship training program in 1979. Frank McGowan did a great deal of work on this and new standards for a three-year program were adopted and went into effect in 1980. Unfortunately, there were less than a dozen officially registered apprentices in the country by 1987. A worthwhile program reached the end of an era, and the Apprenticeship Committee was discontinued. However, in 1990, a renewed interest on the part of the public brought about the reinstatement of the committee. Under the direction of Walter Judson, it has been renamed the Apprenticeship and Craft Training Committee to reflect a need for an additional program that would certify craftsmen in individual stained glass skills, with the hope of eventually leading to a full apprenticeship. The SGAA founded a stained glass school in North Adams, Massachusetts in 1977 to serve as the training center for The Stained Glass Association of America. Association members saw a rapidly growing need for development in professional studio methods of stained glass design and assembly. Approval was given the plan at the SGAA’s 1977 Summer Conference in Dallas, and the Executive Committee named H.W. “Bill” Cummings as Institute Director. In 1980, the Stained Glass School applied for, and was granted a non-profit status by the United States Government Internal Revenue Service and Department of the Treasury, and was thereby exempt from Federal income tax under section 501(c)(3) of the Internal Revenue Code. This designation of the school still exists and allows donors to deduct contributions to the school as provided in section 170 of the Code. Bequests, legacies, devises, transfers, or gifts to the school or for the school’s use are deductible for Federal estate and gift tax purposes if they meet the applicable provisions of the Code. A nine-member board of directors was appointed by the Stained Glass Association of America to direct the Institute. SGAA treasurer and past president Otto Winterich served as chairman. Richard Millard, Kenneth E. Urschel, Helen Carew Hickman, John Kebrle, Paul Dufour, Albinas Elskus, William Laws and John Nussbaum assisted him. During its first three years of operation, 400 students attended classes in North Adams. Inflationary increases in travel costs, difficulties in travel and housing accommodations, and inclement winter weather, began to take their toll on enrollment. At the same time, there was a strong appeal to the school to provide classes closer to the homes of potential students. Members of the SGAA’s Educational Committee, who served as trustees of the school with then-chairman William Malone, responded to those appeals. Regional classes began in January of 1981. It marked a major shift in emphasis for the school organized in 1977 to serve as the training center for The Stained Glass Association of America. By establishing a program of courses offered in more than one location, it was hoped that revenue could be raised to help diminish the escalating operating expenses at North Adams. A few such classes had in fact already been tried, successfully, with the energetic cooperation of Elizabeth Perry (WA), Don Sharp (TX), Penny Starr (CA), Rick Hoover (MO), Dennis Harmon (TN), Chetty Mastroianni (TN) and Thurmon Radford (VA). Financial problems continued to plague the Stained Glass School. During the 1981 SGAA Annual Summer Conference, the Stained Glass School in North Adams was closed by action of the SGAA Board of Directors. Upon the election to the Board of Directors during the 1981 Summer Conference, Elizabeth Perry was appointed, by then-President John Kebrle, to be Chairman of the SGAA Education Committee and concurrently Director of the Stained Glass School. 3. To create a comprehensive, encyclopedic manual on stained glass. The proposed design of the manual would serve as a permanent reference on stained glass for the professional as well as a text for those wishing to teacher the craft. The second goal was realized by the appointment of Kay Botkin as Regional Craft Training Director in 1985 to launch the program, although this program was later discontinued due to a lack of available accredited teachers. The third goal produced the first edition of the Reference and Technical Manual under the guidance of Florence Welborn and her brother, William Davisson. From 1989 until her death in 1991, Dorothy Maddy served as Director. During her tenure, the focus was on updating and printing the Second Edition of the SGAA Reference and Technical Manual for stained glass. Barbara Krueger followed Maddy as the Director of the school. Work was undertaken to broaden educational programs by sponsoring speakers and workshops at the annual SGAA conferences. Krueger finished the work begun by Maddy on the SGAA Reference and Technical Manual, Second Edition. In 1994, Walter “Spike” Grosvenor became the Director of the Stained Glass School. During his tenure, the SGAA Reference and Technical Manual, Third Edition was begun. This revised and updated edition is also available on CD-ROM. The Stained Glass School also currently sponsors several scholarships, including the Dorothy L. Maddy Memorial Scholarship and the Steven Bridges Memorial Scholarship. These scholarship efforts are supported by a biannual silent auction that takes place during the SGAA Summer Conference. A major computerized database has been prepared that provides information on all stained glass educational opportunities worldwide. This was compiled and is monitored by Linda Muldoon and David Mroz and is available to the general public. In 1985, the first Alberto Garcia Award for Excellence in Education was awarded to Dorothy Maddy. The future financial benefits from this donation were then used to assist in the development of the Reference and Technical Manual. With the completion of the second edition, the original award program for teacher excellence was reactivated as a Stained Glass School award. In the summer of 1991, it was awarded to Helene Weis. The Stained Glass School continues to introduce new educational programs to fulfill the needs and requests of the stained glass community. Next to the magazine, Stained Glass, the most meaningful activity of the Association has centered on exhibitions of stained glass which have, over the years, reached throughout this country, South America and as distant as Poland. Undoubtedly, the most significant was the “New Work in Stained Glass,” organized in 1953 as a cooperative effort between the Association and the American Federation of Arts. Sensing that ecclesiastical stained glass was not news worthy enough for the mass media, an invitation to be juried was extended to all artists in this country, not merely those in the stained glass field. Artists were asked to submit a design for a stained glass panel that would be exhibited first in New York and then circulated around the country by the Federation of Arts. Eighteen panels were finally made after several hundred entries had been whittled down. The selection included well-known stained glass artists such as Joep Nicholas, William Haley, Robert Harmon, William Schickel, Marcolino Maas, and Francis Deck. It also included nationally recognized painters who had never done stained glass such as, I. Rice Periera, Abraham Rattner, Andre Girard, Peter Ostuni, Max Spivak, Adolph Gottlieb, Hans Muller, Alfonso Ossorio, and Siegfried Reinhardt who provided designs that were fabricated by member studios. The panels displayed a spectacular variety of modern techniques such as fusing and laminating as well as more conventional leaded and painted stained glass. They were done, for the most part, in ways beyond the imagination of the average studio laboring to please a particular client. The best thing about the show was no one ignored it. Another important on-going show was at the National Episcopal Cathedral in Washington, D.C. The exhibit, which is mainly about the techniques of making windows, became part of the Cathedral’s permanent exhibit in 1956. It has been viewed by tens of thousand of visitors over the years. “Stained Glass, USA; New Directions” was another joint effort of the SGAA and the American Federation of Art prepared under the sponsorship of the United States Information Agency for Latin America. It was comprised of the 18 panels from the “New Look Show” along with actual panels and sketches provided by a number of Association studios. All the titles were in Spanish and it was exhibited in Mexico City; Guatemala City; Quito, Ecuador; Santiago, Chile; Montevideo, Uruguay; and La Paz, Argentina during 1957 and 1958. One of the Association’s most unusual efforts was an exhibit and demonstration workshop at the International Trade Fair in Poznan, Poland in 1958. It was continued in the American Pavilion sponsored by the United States Government. Henry Lee Willet did the demonstrations with the aid of local Polish glass people, and the exhibit consisted of a number of panels donated by Association members including six prizewinners from the 1956 Apprenticeship competition. A large 35 foot high window, which was part of the display and made of glass donated by the Blenko Glass Company, was given to the Archbishop of Poznan as a parting gift. During the six weeks of the fair, well over 100,000 people had the opportunity to learn that the United States is not all automobiles and fancy appliances, but that handcrafts are still a part of the fabric of our country. Biennial apprenticeship competitions began in 1948 as a survey to see how well the apprentice programs begun in 1945 were doing. Forty applications were received and 25 panels were actually displayed at the annual Association conference. The apprentices were usually given criteria for design, size, and frames. Prizes were offered for first and second, a number of honorable mentions divided into glazier and artist categories were awarded. Both a jury and popular vote judged them. The show was held at the annual conference every other year to coincide with the Presidential election, so that through the 50s and 60s the maximum number of people would be able to see it. The exhibition, of what were often some outstanding and innovative panels, became one of the most popular parts of the meetings. After 1978, apprentices were so diminished in numbers there were not enough entries to have a representative show. The Associates, a strong and dynamic group in the SGAA that emerged in the 70s, took over and arranged their first show in 1979. The Associates show grew under the direction of Helen K. Olson, and in 1985, was the highlight of the annual conference with an outstanding exhibit at the Royal Ontario Museum, Toronto, Canada. Other fine Associate shows took place in Chartres, France (also in 1985), St. Louis in 1986, and Corning, New York in 1987. Today, the Associates show has evolved into the biannual All-Member Show, which is open to all members and affiliates of the SGAA. Another notable exhibit was an outstanding show of artist-designer members’ work at the 1980 Kansas City Conference where Rick Hoover arranged to have the panels displayed in the window wall of the Crown Center. The artist-designers also organized a wonderful photographic and design show at the 1987 Corning Conference. An outstanding event at the 1987 conference was the International Competition and Exhibition with a display of 43 panels from Canada, Japan, Australia, Belgium, England, Italy, Israel, Ireland, Switzerland and 14 states in the U.S.A. The panels were displayed in the lobby of the finest glass museum in this country, the Corning Museum of Glass. Exhibitions have been the lifeblood of the Association’s work because seeing actual pieces is important to understanding stained glass in all of its nuances. The highlight of each year is the Annual Convention. Business is discussed, motions made and voted on, officers and executive committee members elected, reports read and exhibitions displayed. But the key reason for coming back year after year is the magic of the unplanned intermingling of artist, craftsmen, business people and suppliers. They exchange ideas, have seminars and socialize, but it is the chemistry generated by these diverse people that make the Association unique and the focal point of the stained glass craft. Several times in it’s history, the SGAA sponsored post-conference tours. In June of 1926, Editor J. E. Flanagan led a party of 16, including Association President Henry Hunt, on a post conference tour of England and France. They visited all the high points of medieval and renaissance architecture including Canterbury, York, Wells, and Oxford. The group was lead by a British guide following an itinerary planned by the British Society of Master Glass Painters. The trip wound up in France with visits to Amiens, Tours, Angiers, Chartres and Paris. 1953 marked the 50th anniversary of the Association and after a brief business session in New York City, 32 persons left Hoboken the evening of April 26 on the Holland-American liner Ryndam bound for an unforgettable six week tour of France, Switzerland, Belgium and Holland. A few of the trip highlights included a party given by the Saint-Gobain Glass Company of France with noted stained glass artists Paul Bony, Jean Barillet, and Raphael Lardeur in attendance. Three glorious days at Chartres featured a roof top tour of the famous Cathedral led by its architect, Jean Maunoury and day long studies of the stained glass in all types of light conditions. There were also brief visits to the Cathedrals of Bourges, Poitiers, Amiens, LeMans, Reims and many others. The group was able to visit the church of Notre Dame de Tout Grace in Assy where the most famous artists in the world including Matisse, Rouault, and Chagall had been responsible for the glass and other decorative features. One of the newest major SGAA projects began with Sourcebook ’97 and continues today with subsequent Sourcebooks. The SGAA Membership Directory, a longtime feature of Stained Glass Magazine, has been removed from the magazine to allow for even greater editorial coverage and put into its own publication, the Sourcebook. 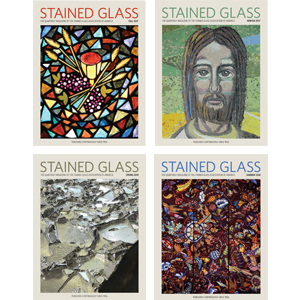 This annual publication, which is mailed to an ever-expanding list of architects, liturgical consultants and church building committees, presents the complete membership roles of the SGAA, as well as informative articles promoting the use of stained glass. 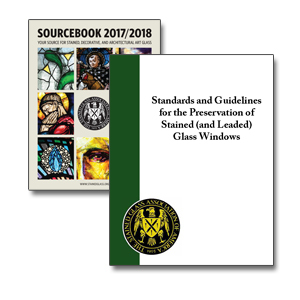 The accredited membership of the SGAA can also purchase advertising in these Sourcebooks and promote their studios directly to the architects, consultants and planners who specify and purchase stained glass. The makeup of the Association hierarchy has been stable from its conception in 1903 to present day. The officers are elected annually, but since 1939 they have been unable to serve more than two consecutive terms in one office. Officers consist of President, First and Second Vice-Presidents, Treasurer and General Secretary. The Executive Committee consists of the officers plus two groups of three people each. Each group serves for two years and cannot be re-elected without stepping down for one year. This insures no one gets too entrenched and it also opens up opportunities for a broader spectrum of the membership to participate in Association work. The President is of key importance because he or she sets the tone of the meetings and establishes priorities. The formal meetings are to acquaint the general membership with what decisions have been made in Executive Committee meetings. It is in this smaller group that the real business of the Association is conducted. Any member can sit in on these meetings but has no voice or vote. The President’s Badge of Office is a “collar” somewhat similar to a wine steward’s neck chain. Henry Hunt, Otto Heinigke and Sydney Brown designed it in 1928. It has a large replica of the Association seal at its base made in silver and enameled in red and blue. The enamels were fired in the kilns at the Rambusch Studio. Smaller medallions with glass worker’s tools embellish the chain that hangs around the President’s neck. The “collar” is worn by the President at all official functions including meetings and the annual banquet. From its inception in 1903 until 1939, there was only one type of membership in the Association, that of a Studio or Professional. Applicants for this category were required to pass specific requirements for membership; in return, they received a vote and many other benefits. As the Association grew, new types of memberships evolved to meet the needs of various groups within the organization. In 1939 Associate memberships were opened to all workers or people interested in the development of the craft. $5.00 dues included a subscription to the magazine. No companies could be associate members, only individuals. In that same year two honorary members were named: renowned Boston architects, Dr. Ralph Adams Cram and Dr. Charles D. Maginnis. Subsequent honorary members have included Otto W. Heinigke, Albert W. Klemme, Harold E. Wagoner, Kenneth Urschel, Naomi Mundy, William R. Malone, Thomas Buechner, Helen Hickman, William Davisson, Hilda Sachs, Marguerite Gaudin, Cecil Wilson, Peter Gibson, Frank Reusche and Richard T. Feller. There had been life members of the Association over the years but the category was not formally recognized until 1969 when George Hunt, who had retired, was elected a Life Member for his service to the Association and active membership for more than 25 years. Other life members have included Stanley Worden, John Riordon, William Burnham, Jr., and William H. Blenko, Jr. The category of Elder Statesmen was quickly renamed “Fellow” at the 1956 convention. It was for older chief officers of studios who had been active in the Association for 12 or more years and had delegated their rights to another member of the studio but were still active in the craft. Once elected, the member can remain a Fellow as long as his or her studio is a member of the Association. They have a vote and can serve on committees, but they cannot hold office. The first three Fellows elected were Wilbur Herbert Burnham, Sr., Harold Rambusch, and Orin P. Skinner. Other Fellows have included Emil Frei, Edward W. Hiemer, Karl Barre Lamb, Fred P. Oppliger, Harold Rambusch, Henry Lee Willet, Harold Rams, Bernard 0. Gruenke, Frances OÕDuggan, Stephen Bridges, Harold Hollman, John D. Weaver, James Helf, Otto C. Winterich, Michael Poremba, Patrick J. White, Gerhard Hiemer and Conrad Pickel. In 1966, Artist/Designers who accepted contracts in their own name or were employed by studios were separated into their special category. They have equal vote with studios and can serve in any elected office. At the 1968 convention in San Francisco, the craft suppliers were welcomed as members of the Association with their own category and a seat on the Executive Committee. The Associates category, which had been relatively quiet for over 30 years, was growing at the rate of ten new members a month by 1975. They decided to organize their own group. Until the membership categories were reorganized in 1994, they had voting privileges based on one vote for every 25 members in attendance at conferences. They were traditionally among the most active participants on the various Association committees. In 1988, the category of General Associate was initiated. It consisted of Associates who submit criteria for membership. Their representation was based on one vote for every five members present at the Conferences. In 1994 at the St. Louis convention, sweeping changes were made to the categories of membership. These significant changes were enacted to make membership in the Association more appealing to a broader spectrum of the craft and to better reflect the modern trends in stained glass. The Association officers and directors realized that, unlike in the earlier part of the century when the majority of windows were made by large studios that specialized in liturgical windows, the trend today is toward smaller studios and individual craftpersons who undertake autonomous panels, private commissions and a whole host of other similar items constructed of glass under the aegis of stained glass. While large studios are still responsible for a considerable portion of the craft, the smaller studios and individual practitioners are just as valid. The SGAA officers and directors further realized that for a trade association to be strong, it must represent its constituents equally and allow those constituents to equally represent themselves within the organization. This important premise was the focus of the reorganization of the membership categories and their criteria. The membership categories were redefined as Accredited Members (which replaced Professional Member), Active Members (which replaced Associate Member), Affiliates, Student Affiliates, Emeritus and Honorary. The most significant change is reflected in voting eligibility; after the 1994 Conference, Accredited and Active members were each granted one full vote on any issue brought to the floor of the Association meetings. Also, SGAA by-laws were modified to allow absentee voting on any issue known in advance of an official meeting. This change specifically includes election of SGAA officers, bylaws changed and other issues required to be brought before the membership in advance of a meeting. Another sweeping change was the eligibility to hold office in the SGAA. Prior to these changes, only Professional Members could hold elected office. After 1994, all Accredited and Active members were eligible to hold office, with the exception of the Presidency, which may only be held by an Accredited member. By allowing the Active members to hold elective offices, the SGAA dramatically increased the number of perspective candidates for the office. More importantly, the Association has increased the opportunity for an influx of new ideas and enthusiasm. Today, Accredited Membership is available in three classes: Studio, Artist/Designer and Supplier. To qualify for this level of membership, the applicant must have a minimum of 4 years as a licensed business. References and a portfolio are required submissions. Active Membership is open to any individual involved in the craft for a minimum of 2 years. References are not required and active members may join at any time during the year. Accredited and Active Members receive equal voting privileges and may hold office. An Affiliate Membership or Student Affiliate is open to any individual desirous of enriching his or her involvement in stained glass. 1956 Boston, MA Wilbur H. Burnham, Jr.
1957 Sun Valley, ID Wilbur H. Burnham, Jr.
1958 Philadelphia, PA John D. Weaver, Sr.
1959 Los Angeles, CA John D. Weaver, Sr.
1972 Milwaukee, WI A. W. Klemme, Jr.
1973 Savannah, GA A. W. Klemme, Jr.
That the Stained Glass Association of America is the authoritative representative of the art and craft in this country has long been debated. It is obvious that an organization such as this cannot be all things to all people. However, it is conclusive that the Association magazine, Stained Glass, has accumulated a treasure house of information about the medium that is unrivaled in any other publication. Through the initial hard work of Darlene Brady and William Serban, and with Serban continuing, an index of all the issues has been compiled and a reader can now locate, by page and issue, any subject by author, title or category. For the truly dedicated stained glass lover, nearly every issue is also available on microfilm. It is fascinating to read through this panorama of events and learn that the problems of yesteryear are much like those today. While early issues tended to be mostly business oriented, since the 1930s the artistic and craft parts have come to the forefront. Work of artists who claim to disdain the Association is shown in equal amounts with member studios’ work. Other groups and magazines have come and gone but the Stained Glass Association of America and Stained Glass have survived and flourished for 88 years. The association having by far the largest and most diverse active membership in its history shows evidence of the current vitality. 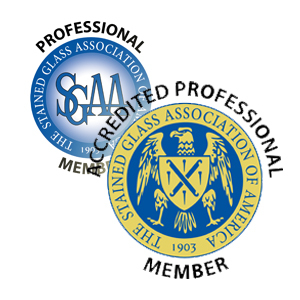 The SGAA should continue with ever increasing strength this new century as the spokesperson for American stained glass. Wilson, H. Weber. Great Glass In American Architecture, New York: E. P. Dutton, 1986.